A review of the 2012 and 2013 skis is already available if you scroll down through my posts. However, there has been one important change for 2013 and 2014 and that is the addition of the 192cm Mr. Pollard Opus. Other than a new graphic and a new size the ski stays the same. The Line Mr Pollard Opus has been one of the best-selling skis of 2012 and we expect 2013 to be even better! A few select dealers still have the 2013 Mr. Pollard Opus skis so be sure to get yours today! Still one of my favorite skis you can not go wrong, unless you go to short. The 192cm length in the Mr. Pollard Opus is my favorite go to do everything ski. Now witht he addition of the Sir Francis Bacon in the 190cm length that will probably turn into my All Mountain Ski along with the all new amazing Head Cyclic 115 Skis. 2014 Line Mr. Pollard Opus Sale! Here is the review of the 2012 Line Mr. Pollard’s Opus Skis which are the same for 2013 and 2014, but now with the additional length of a 192cm length!! Most versatile pair of skis I have ever owned is the all new 2012/2013/2014 Line Mr. Pollard Opus skis. The Line Mr. Pollard Opus skis does whatever you want the ski to do in any conditions and terrain. With the float of the EP Pro and the maneuverability of the Sir Francis Bacon the Line Mr. Pollard Opus skis are the ultimate one ski quiver ski. Although the ski is narrower than the EP Pro it still has amazing float thanks to where the Early Taper and Early rise have been located. Eric Pollard designed these skis as his masterpiece and as someone who has not only skied every ski that Pollard has designed but also has been skiing with the man himself he has combined all the best of his creations into this one ski. If you are looking for an excellent AT ski but don’t want the waist width of the Opus then I would suggest the Sir Francis Bacon. If you are looking for a ski to help you poach your favorite places then this is my weapon of choice. 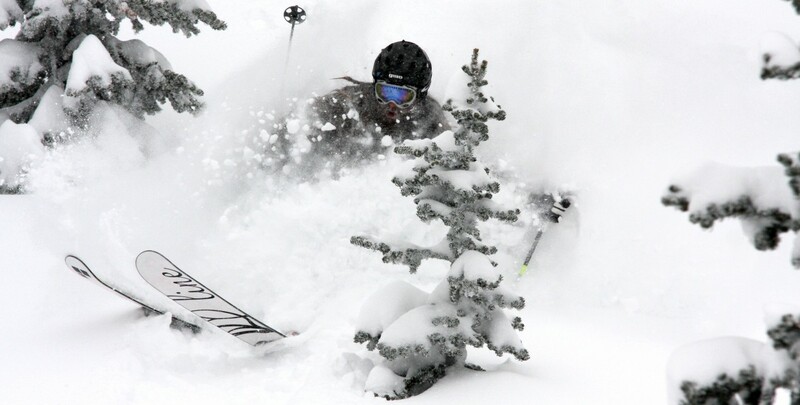 It will ski the deepest of powder with ease while attacking the windblown snow with very little effort. 2 places the Mr. Pollard Opus excels in where many others in this 115mm+ waist category does not is on the groomers and bumps/moguls. I was able to make full pull bump runs with very little effort or adjustment. When it came to skiing glades there was no other ski I would rather be on than the Opus. If you are charging hard and enjoy a stiffer ski than you would want the Prophet 115 or Influence 115, but if you enjoy a ski with tons of playful energy and one that just enjoys everything in front of you then the Line Mr. Pollard Opus is a ski that you really should not pass by with out buying. It looks like untracked.com or Al’s Ski Barn has these in stock right no and ready to sell! !